:: clevergirl.org ::: 182. First garment from Japanese pattern book! 182. First garment from Japanese pattern book! And I was feeling like a lunatic for having a stash of Japanese pattern books for 2 1/2 years and not sewing from a single one. Several people have suggested I sew from these books as the sizing might have a better unmodified fit for me than American patterns. 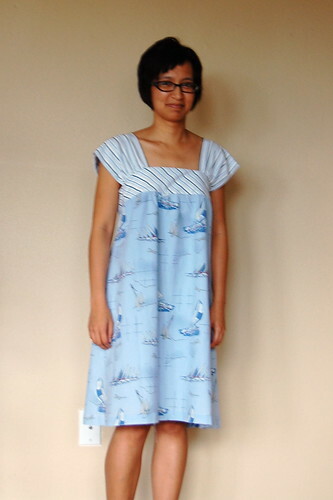 Oh, and Karyn from The Workroom has sewn a bunch of garments from Japanese pattern books that are very inspirational. So I finally got off my duff and sewed this dress. In many of these books, there is a lump of paper stapled in the back of the book with all the patterns printed on them, overlapped in a big jumble (very much like Burda and other magazines). You unfold the oversized sheets of paper and trace out the pieces you need, then add your seam allowance. There is a great series of posts with detailed instructions on sewing from Japanese pattern books over at Label-Free. I mean, the whole thing is beautifully written and photographed. As an adult learning professional I was blown away by the quality of these instructions! Aaaaand it won't surprise you that I didn't use those great instructions at all -- I just sort of went on instinct with the whole process, from selecting the pattern to construction. I think most advanced beginners/ intermediate or vaguely adventurous sewists who aren't native Japanese speakers should be OK half-winging like I did. And for everyone else, there are those great Label-Free instructions! My strongest suggestion is to be diligent about transferring notches/ markings. Really pays off later. As for oversized paper to trace onto... sometimes I finish a class and I've written notes for everyone on the flip chart, and I frequently don't re-use those flip chart pages because they are specific for that group of learners. Since I don't trust most hotels to recycle, I end up taking the oversized sheets from the flip chart (I think the standard size is 24" x 36", or 61cm x 91 cm for my metrically-inclined pals) home to draw on the back with my son before it goes into recycling. In this case, I recycled two of these oversized sheets to trace out the bodice pattern pieces. Bonus: I happened to recycle flip chart paper with the strip of adhesive on the top, like a sticky note -- and it's just the right stickiness to hold the tracing paper to the pattern piece and peels off easily when tracing is done! The pattern itself was perfect for me. I chose a size 7 based on the sizing chart, and even though my measurements fall between a 7 and 9, all the styles are so loose that I went with the smaller size. It is still loose enough that I omitted the side zipper and it slips on over my head easily. Everything lined up and the shape (though on the less shaped side for sure) was already petite-ified, requiring no pinching an inch in length at the waist as I typically do for a Big 4 pattern. 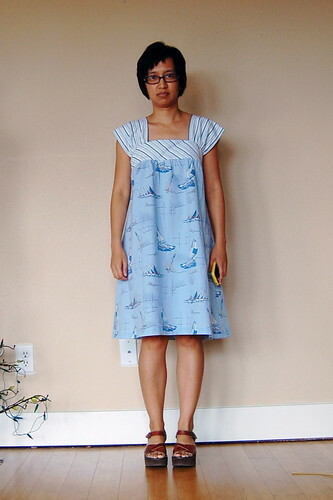 I shortened the dress by a good 5" at the bottom hem, as it seems many of these dresses are meant to fall mid-calf -- not the most flattering length for me. I might get away with it if I could sport a softer voice and waifish demeanor, as I imagine these models have. But not me. I did fudge a little as this was a shirt refashion: specifically, I omitted 3" in width from the front bodice and 2.5" in width from the back bodice because the shirt simply wasn't wide enough. The fit is still fine and frankly, I think my version has a slightly more flattering shape than the original in the book. The dress buttons up the back. 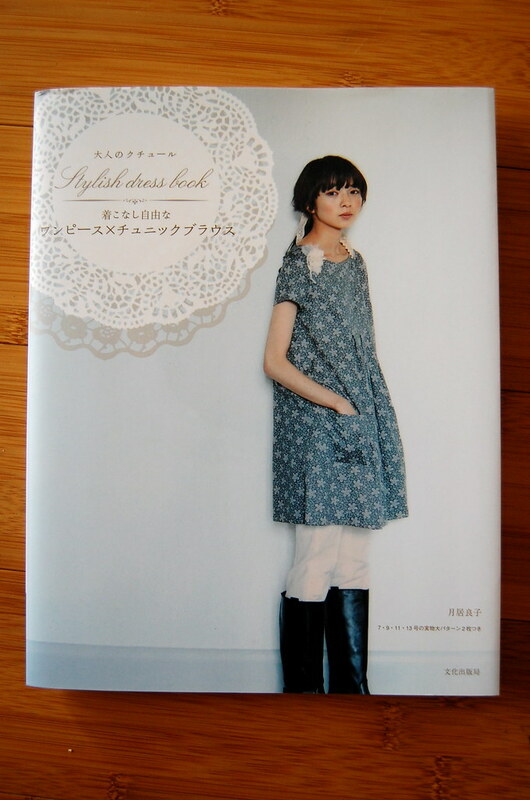 I bought this pattern book and its follow-up, Stylish Dress Book 2, from YesAsia.com, which offers reasonable prices and free shipping. This is a great place to go if you know exactly which book you want to buy and they stock it, but Amazon.co.jp offers a much wider selection (and hefty shipping charges if you are buying less than about $200 in merchandise last time I checked). There are sellers on Ebay and Etsy who specialize in the Japanese sewing/ craft books, too, but the total cost including shipping sent me back to YesAsia. I'm no expert sewing from these books so if you have some tips to share, please leave them in a comment! I can see myself using these books more in the future. What about you -- have you taken a luxurious holiday just for you? Did you feel guilty? Did you completely get over it? Simple design but so lovely. Well done. Have fun in Hawaii. Lucky you! I've never tried sewing from one of those books, I can barely follow a good old Simplicity pattern. Awesome dress!! Looks good on you! Love the fabric pairing! You are such a good re-fashioner. Nice dress! Beautiful dress and great reuse of the fabrics. I recently bought the draping book but haven't made anything yet. The designs are awesome and a lil' intimidating. Lovely Dress!! Like you, I like the way the shoulders gather and drape over the shoulder bone. Wow - a vacation just for you? I've often dreamed of such a luxury, but have never, ever had the opportunity to indulge. Heck, even vacations with the family usually mean work for me, since I'm the head organizer, packer and rememberer of all things that cannot be forgotten! I am so happy that you get this chance - embrace the sunshine and let go of the guilt. Have a load of fun laying on the beach doing nothing!! I love the dress esp. the sailboat motif! It looks adorable on you. You deserve the trip to Hawaii!! very jealous!!! Merry christmas. Oh man, Hawaii! Have lots of fun!! I'm so excited for your Hawaii trip!!! The dress is cute. I like that design, and also like the sailboats! Maybe I ought to look into Japanese patterns as well - if I ever get the time HAHA! Hawaii? "Alone"? How lucky are you?! I'd love to go on a girls' vacation, maybe when there aren't so many babies in the group. I love that you recycle the flip chart pages yourself, whether taking them home to draw on or make a pattern piece out of it! go you! you absolutely deserve your time in Hawaii with your BFF. I've never taken time away from my hubby, but I bet I would if the opportunity presented itself. have a lovely time! oh and p.s. great dress! I went on a girls-only vacation once, and it was the best vacation I have ever had in my life. I have never been so relaxed as I was when I came back. @Pam - Thanks, and yes, I do feel really lucky! I've never been to Hawaii before. 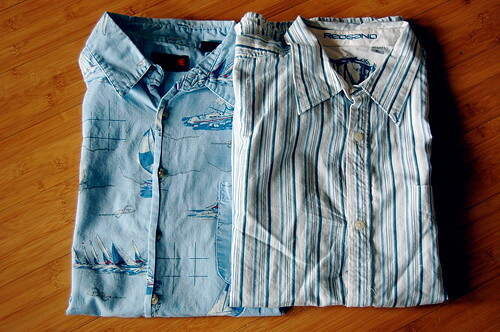 @Laura - The best benefit of boring men's shirts is that there are just a few colorways of cotton shirts! They all kind of mix and match easily, ha. @Gail - Ooooh, which draping book? I think all of my Japanese books are pattern-based. @Angela Pea - It sounds so ungrateful to say, but my family vacations are usually more work than working. Which is prob. exactly what you have decribed! I am starting to feel a little excited about the trip! @Cindy - Thank you so much! @Wendy - I almost started a pattern from this book over the summer, but got freaked out by the many, many markings in Japanese. I must have gone back to it on a lucky day because everything seemed very clear last week when I traced it out. @Kyle - Can't wait to get more insider tips from the Hawaii expert! @Sarah - Nice to hear from you! :) These are great books for the short of stature. Let us know if you try one out. @Christy - The fuller house is.... fuller! LOL I've missed you, too. I can't believe that I've never really gone on a girls' vacay. I have some great friends, just never got our schedules connected I guess. Very cool. I hope you have fun on your vacation! I've seen this adorable dress on a bunch of French blogs, as French sewers are crazy about Japanese patterns. I do have a couple books at home but I must admit that I'm turned off by having to trace the pattern onto some kind of paper that's big enough -- which I don't have. This is actually the reason why I don't use patterns when I sew. Where do I find tracing paper big enough to fit any given pattern? Great job! I love the dress! Hmmm... i must look into buying one of those Japanese books, too. I love the looks! Thanks for all the suggestions on places to look in purchasing these. :) Merry Christmas (I know it's already past.. Sorry!) and Happy New Year! Have a swell time in Hawaii. You totally deserve it. @Villblomsten - Thank you, and Merry Christmas and Happy New Year to you, too. @NGLaLaLa - I am looking forward to my next dress from one of these books! Hope you try one. Happy New Year! @quelle - Awesome! I've never been to HI so I am counting on your expertise. :) Hope you had nice holidays! @Trish - Thanks, dear! Appreciate your words. i am an idiot too with a little stack of those japanese books that i've yet to sew from. but you're not an idiot anymore....and you look so cute in that dress....i have yet to take a vacation like that without the family. but i am feeling kind-of open to it! i am so curious to hear how you feel when you get back. i hope it is so wonderful.